Whatever will happen in the future, we shall not repeat the mistakes we made in leaving Gaza. You take my water. Burn my Olive Trees. Destroy my house. Take my job. Steal my Land. Imprison my Mother. Bomb my country. Starve us all. Humiliate us all. But I am to blame: I shot a rocket back. February 20, 2009 “Dissident Voice” — Ain el Helwe Palestinian Refugee Camp, Sidon, Lebanon — Israeli President Shimon Peres has participated in shaping the policies of Israel for most of its existence. His Washington Post op-ed last week billed as “a peacepartners prod” to the Obama administration, evidences a major disconnect within the government of Israel concerning what is urgently required for that country’s increasingly unlikely long-term survival. Wanted! for dyeing her hands and protesting aginst murder! CHARGES against a Jewish woman who was arrested while protesting against the Israeli Government’s treatment of Palestinians have been dropped. Woodford Green activist Naomi Wimborne-Idrissi, 56, was due to appear at the City of London Magistrates court today following her arrest at an Israeli parade in London last June. But with just hours to go until her court appearance, the Crown Proescution Service announced it would abandon the case because it was not in the public interest. Ms Wimborne-Idrissi said: “This decision is welcome, of course, but it raises the question, why was the case brought in the first place? 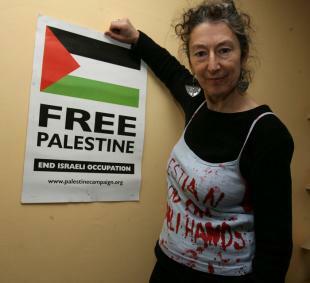 “I have taken legal advice and am now considering whether to bring legal action against the police for wrongful arrest.” It comes after an incident on June 29 2008 when Ms Wimborne-Idrissi held up a sign reading ‘Palestinian blood on Israeli hands’ at an Israeli parade along Haymarket in central London. She also dyed her hands red. There are many reasons to feel more pessimistic than optimistic about the possibility of any major breakthrough in the Israeli-Palestinian conflict this year. The inaction by the international community, especially the United States, over the past few years has made the situation more complicated, with increased violence and hardened public opinions on both sides. In the aftermath of the Gaza war, Hamas’ popularity has increased, both inside Palestine and in the wider Arab and Muslim world, with growing support among Palestinians for military resistance. Israel has shifted politically to the right, with broader acceptance of the “fifth column” theory, which views Palestinian citizens of Israel as a security threat. Any talk of a peace process has negative connotations for both sides. For many Israelis, it raises fears that land returned to the Palestinians in the West Bank will eventually be used for launching rockets, as happened in Gaza. Similarly, for many Palestinians, the continuation of the peace process means endless talking without results as Israel continues to annex more Palestinian land for building or expanding settlements. Internal political considerations add more problems to the mix. Hamas’ political platform differs greatly from the Palestinian Liberation Organization’s (PLO’s) and Palestinian Authority’s embrace of a two-state solution with an Israeli withdrawal to the 1967 borders. Instead, Hamas has suggested a long-term truce with Israel with no formal recognition. In Israel, the platform of the Likud party and Prime Minister-elect Benjamin Netanyahu, unlike those of the Kadima and Labor parties, does not accept the concept of “land for peace” and the establishment of an independent, viable Palestine. Instead Netanyahu is promoting a vague economic peace plan. Thus, any coalition or unity government, on either side, is likely to be unstable because of serious political differences between the parties involved. This decreases the probability that either side will be able to act on the terms of previously suggested end of conflict agreements. We enjoy the counting game when it comes to the Arab-Israeli conflict, hypothesising about the number of states that must be created to end this conflict. The one-state solution is an idea coming from part of the Palestinian liberal elite that calls for one state for two nations: Israelis and Palestinians. The idea is rejected by Israelis as political suicide because demographic trends will mean a Palestinian-dominated state in 20 years or so. The three-state solution, advocated by John Bolton, is equally provocative. It calls for solving the Arab-Israeli conflict by divvying up Palestinian land between Jordan and Egypt. These two countries would fulfill the international community’s expectation that Israel’s security be protected while maintaining the well-being of the Palestinians living in the West Bank and Gaza. Jordan and Egypt view this solution as contrary to their interests. Indeed, it would place the brunt of the political and economic burdens on them. It is also provocative because it is reminiscent of past Orientalist policies that viewed Arab states as simply space on the map, not autonomous political actors with their own interests. The five-state solution is promoted by Thomas Friedman, who is also one of the architects of the Saudi peace initiative. Friedman’s plan requires close cooperation between Israel, Egypt, Jordan, Palestine and Saudi Arabia. Jordan and Egypt would ensure security in the West Bank and Gaza, while Saudi Arabia would be the financier of their efforts. This proposal is also rejected by Jordan and Egypt because they would be seen by fellow Arabs as undermining Palestinian aspirations for statehood. The Obama administration seems aware of the motivations and shortcomings of the above-mentioned proposals and has made a two-state solution the “inevitable” strategy for peace. This contrasts with the Bush administration’s approach, which viewed the two-state solution as the “vision of the president”. The leader of Lebanon’s Islamist Hezbollah movement, Hassan Nasrallah, has said his group will never recognise Israel’s right to exist. He was responding to a US suggestion that both Hezbollah and the Palestinian faction Hamas should recognise Israel before expecting any US engagement. “We reject the American conditions,” he said. “As long as Hezbollah exists, it will never recognise Israel.” Israel and Hezbollah’s armed wing fought a bloody conflict in 2006. Mr Nasrallah made the statement rejecting the US conditions for talks said in a speech marking the birthday of the Prophet Muhammad. Hezbollah leads a bloc in Lebanon’s parliament that has veto power over major decisions in the unity government. The coalition was formed last year after a political crisis that brought the country to the brink of civil war. Last week, the UK said it would establish low-level contacts with the group, citing “positive political developments”. US President Barack Obama has extended sanctions against Iran for one year, saying it continues to pose a threat to US national security. In a message to the US Congress, Mr Obama said Iran was acting contrary to US interests in the region. The sanctions, which ban US companies from investing or trading with Iran, have been renewed annually since 1995. The US fears Iran’s nuclear programme is a cover to build atomic weapons, a charge Iranian officials deny. Enriched uranium can be used in nuclear power plants, but can also be used to make atomic weapons. Barack Obama was elected on a message of change. Now he is in office, change is expected both in foreign and domestic policy. Here the BBC’s team in Washington tracks developments in the first 100 days of the Obama presidency. Richard Lister: The withdrawal of the Obama administration’s nominee to Chair the National Intelligence Committee has triggered a debate about the power of the Israeli lobby. In a letter explaining his withdrawal from the appointment process, Charles Freeman launched a blistering attack on what he called the “Israel lobby”. He said it had lied about his record, smeared his character and attacked his credibility. Had he become Chair of the National Intelligence Committee, Mr Freeman said, the attacks would have continued and undermined America’s intelligence agencies. The American Israel Public Affairs Committee – one of Washington’s most influential lobby groups – has denied taking a formal position on Mr Freeman. But many other pro-Israeli commentators had strongly attacked the appointment, accusing him of being too close to Saudi Arabia, a country where he was once the US Ambassador. His criticisms of Israeli government policy and past comments in favour of the Chinese government were also highlighted. Mr Freeman had been touted by the Administration as someone who could examine both sides of an argument. Mr Freeman said his treatment raises questions about the Obama team’s ability to make independent decisions about Middle East policy. Kim Ghattas: There’s a split between Washington and London over Hezbollah. The US lists Hezbollah as a terrorist organisation and blames it for the 1983 bomb attack on the US Marine barracks in Beirut which killed 241 Marines. Washington believes that Imad Mughinyyeh, a top Hezbollah commander was the mastermind. He was killed last year in Damascus and the US official said life in Lebanon was “marred” by posters “extolling the virtues” of Imad Mughniyyeh all over south Beirut, a Hezbollah stronghold. Asked if they had been informed about the British decision, the official said that “informed under a previous administration” was a more accurate description. This suggests the Obama team had not been given enough notice. A British diplomat told me the decision was driven by the belief that it is possible to encourage Hezbollah to move away from violence and become an integral part of Lebanese politics. I put it to him that the same argument could be made for engaging Hamas; he said the Palestinian group had to first recognise Israel’s right to exist.